BrightRain Border Terriers was established in 2005. My good friend, Carole Bernier, of Bernfield Kennels in Nova Scotia convinced me it was time to have a dog back in my life. 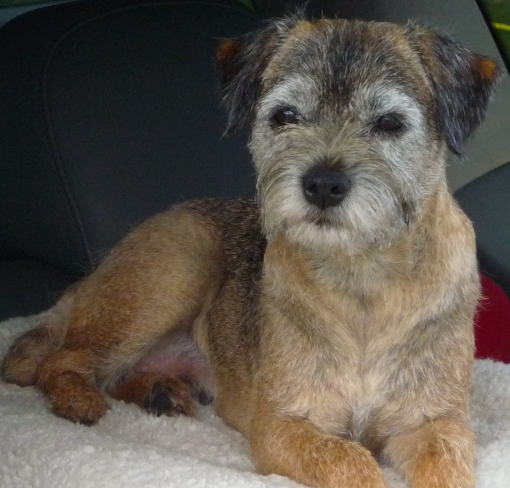 She offered me the pick puppy from two of her Border Terriers I had often admired - “Kiwi” (Am Can Nzd Ch. Bohunt Mill Lane Vicar), and “Thyme” (Can Ch. Bohunt Razzamadazz). As luck would have it, there were eight puppies in the litter including six girls for me to choose from. After an excruciating weekend of decision making, “Ruby” (Can Ch. Bernfield’s Bright Rain Ruby JE) flew back to Ontario with me to be our new family dog. She has been a truly wonderful addition to our family. This story might have ended here but Carole convinced me that Ruby should be shown. With Carole’s guidance, support, superior grooming skills and expertise at the end of the lead, Ruby easily obtained her Canadian championship. I was hooked! Ruby was bred to “Levi” - the wonderful Am Can Eng Ch Conundrum Co-writer. This pairing produced “Tilley”- Am Can Ch BrightRain’s First Edition ME. Tilley had a stellar show career that included a Best in Show and was not once, but twice Best of Winners at the prestigious Montgomery County Terrier Club Show. I was even more hooked – hook, line and sinker! 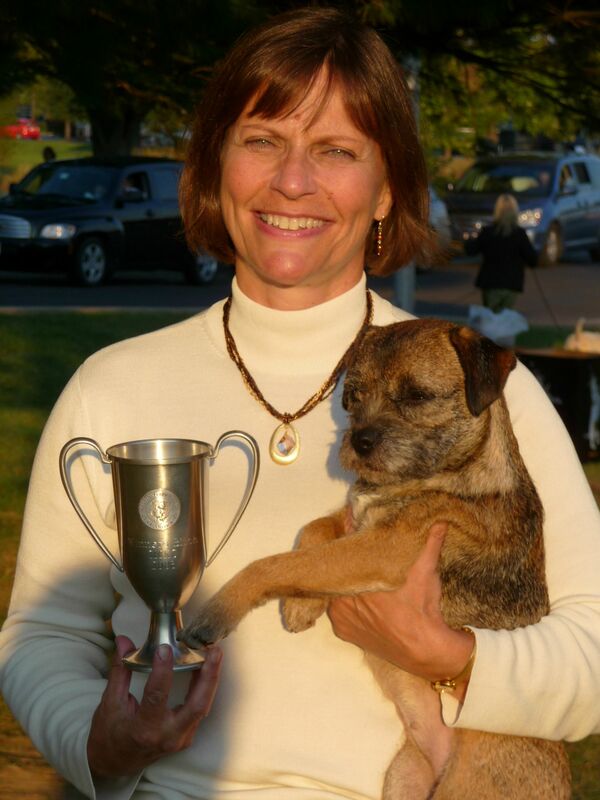 Tilley is now retired from breeding but her daughter, “Quinn” - Can Ch BrightRain’s Quinntessential SE carried on her winning traditions, including going Best of Breed at Border Terrier Canada’s National Specialty in July 2012. To date, there have been eight Canadian Champions and three American Champions associated with BrightRain. In 2015, the 4th generation of BrightRain Border Terriers were born. I take great pride in producing conformationally correct, healthy Border Terriers with exceptional personalities that can excel at a variety of doggy pusuits. Earthdog trials are a true passion for me and a heck of a fun day for my dogs as we pursue these elusive “working dog” titles. But mainly, I derive true pleasure introducing these wonderful “little brown dogs” to prospective buyers, enjoying their family visits with the litter as the puppies mature and then ultimately sending a special puppy to their forever home. The Border Terrier, once known as The Coquetdale Terrier, originates from the rugged hill country found near the north border of England and the south border of Scotland - otherwise known as 'The Border Country'. The breed can be dated back to the 1700’s and shares its ancestry with that of the BedlingtonTerrier and the Dandie Dinmont Terrier. Borders were developed by the farmers and shepherds of the area, who wanted a game terrier with sufficient leg to follow a horse to help contain the local marauding fox population. In the 19th century when foxhunting developed into a sport, the breed became part of the more formal foxhunting scene. Its purpose was to 'bolt' foxes when they 'go to ground'. In other words, when the hunt came to a stop because the fox had gone into one of its underground lairs, the Border Terrier had to go underground and either 'bolt' (chase out) the fox or stay with it and bark. This is to indicate to those above ground where the fox is located so that they can dig down to their quarry. Once bolted, the hunt could continue. However, the Border should not be too aggressive in attacking the fox underground. Rather he should threaten him and preferably chase him out. 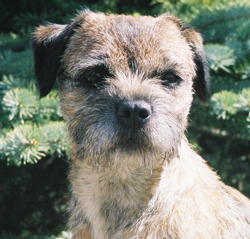 Today's Border Terriers can still do the job for which they were bred. 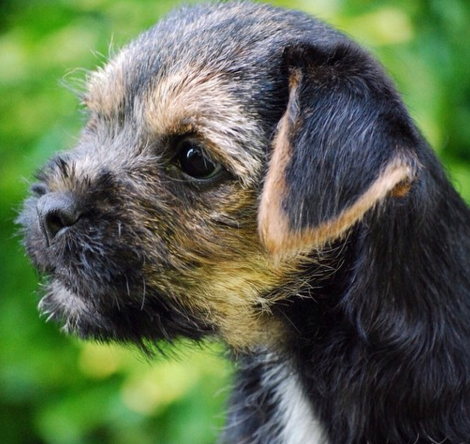 The Border Terrier, once one of the rarest of the terrier breeds, is gaining popularity. A sturdy, natural looking terrier, the Border Terriers distinctive head resembles that of an otter, giving the Border a charming expression that could be the reason for its growth in popularity. They are the calmest and least aggressive of the terriers. Border Terriers get along very well with other dogs if properly socialized as the breed was originally intended to hunt with the hounds, so everyone getting along was essential. Border Terriers stand approximately 12-15 inches high at the shoulder and weigh between 12 and 17 pounds if kept at the optimum weight. They have short, hard, wiry coats in shades of red, grizzle and tan, blue and tan, or wheaten over a dense undercoat. This double coat and a thick, loose pelt protect them from unpleasant weather and their quarry's sharp teeth! Their coats do require some grooming to keep the dog looking tidy and matt-free. Twice a year they should have their coat “stripped” out. This is accomplished with either a stripping blade or done by hand. In between times, they need to be occasionally combed/brushed, but rarely need baths and shed very minimally. They are not considered a hypo-allergenic breed, but people with mild allergies can generally handle having a Border Terrier around. Their life span averages 13-14 years. The Border Terrier has been described as a "big dog personality in a small dog body”. They make excellent family pets as they are intelligent, perky, very affectionate and have a special love for children. They are intelligent and eager to please, but they retain the capacity for independent thinking. The Border is very adaptable and once it has worked out the pattern of their owner’s lifestyle, will adapt their waking and sleeping routine to suit. Cats (in the house) are no issue for this breed if they are raised with them. They are good watchdogs but not foolish barkers. These are wonderful dogs to explore nature with as they will walk miles with you in any weather and really enjoy swimming. They are tireless but not hyper as some other terrier breeds can be. It is recommend that they are kept on lead at all times when walking as this is a hunting breed that will investigate any sound and will chase anything that moves! That being said, they are great observers and often love to just sit and watch what is going on. Many Borders will eat with great gusto far more than they need if given the opportunity and this will quickly be reflected in the dog's waistline! Don't be taken in by the doleful look that will be quickly repeated with even more determination if you decide to share any scraps of your meal with your 'starving' friend who was probably only fed ten minutes previously! The Border Terrier is a natural clown, always trying to please. This makes them great show dogs. They are extremely trainable, and capable of learning tricks quickly and competently. Borders do well in task-oriented activities and have a surprising ability to jump high and run fast given the size of their legs, allowing them to excel in obedience and agility training.They also do very well in earthdog tests and flyball and have been very successful as therapy dogs. Check back soon for more details! 3-time Canadian Champion, 11 Group placements including 4 Group 1st, 3rd Border Terrier in Canada in 2005, Junior Earthdog designation. Will always be my 'heart' dog. Best In Show Winner (only the 2nd Border Terrier in the history of the breed to accomplish this), Best of Winners at the prestigious Montgomery Kennel Club All Terrier Show in 2007 and 2008, American Championship obtained with three 5 point Majors in limited showing, 5th Border Terrier in Canada 2007, Junior Earthdog designation. Tilley excels at earthdog and is happiest in the field. An elegant Border Terrier - beautiful head and expression, narrow, efficient mover, great length of rib with the harshest coat imaginable. 4 points towards her Canadian Championship. Quinn is a loyal dog, quiet to a fault. Her ability to sunggle in your lap rivals her mother. Loves leather chairs! Thank you for your interested in BrightRain puppy. The next planned litter is Charlotte and Finnegan expected in the fall of 2016. Please contact me (Kirsten Goodman) at k-vet@sympatico.ca if you would like to know more! If you are thinking about getting your first Border, I highly recommend that you research the breed thoroughly prior to committing to a puppy. Prospective owners should do alot of reading, talk to breeders, attend a dog show or visit someone with a Border to ensure that this is the dog for you. As engaging and intelligent as the breed is, they are not for everyone. I encourage you to come and visit the BrightRain gang to get an idea if the breed is a fit for you. I am small hobby breeder that generally only has one, maybe two litters a year. I often have a waiting list for puppies, so if you are genuinely interested you need to commit and then be patient. A $200 non-refundable deposit is required to reserve a puppy and of course is deducted off the final purchase price. Be Canadian Kennel Club (CKC) registered – this is a testimony of proper breeding practices and ethics. A CKC registered puppy is a proven purebred dog with a traceable heritage. This registration will enable you to participate in various CKC events. BrightRain puppies are very well socialized as they are raised in the kitchen. All my dogs live in the house are part of our family and our lives. The puppy’s parents will have been (1) eye checked for inherited problems and (2) X-rayed free of hip dysplasia. One or both parents will be Canadian show champions and/or American show champions. I enjoy doing Earthdog and most of my dogs have at least one title in this CKC doggie sport. I insist that my puppies go to a home that has a secure fenced-in back yard. Puppies sold for pets must be spayed or neutered by 6 months of age. Show prospect puppies are available occasionally. Obedience training is highly recommended. What makes a Border a Border and where did he come from? 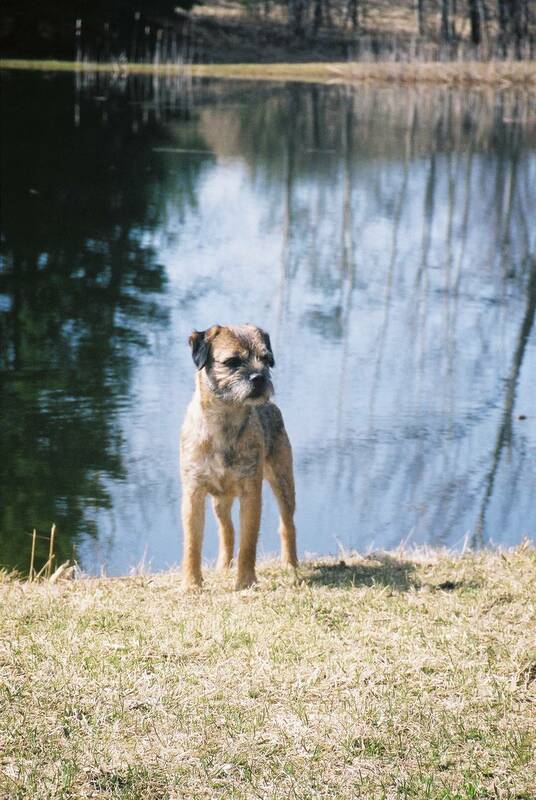 Bright Rain is a hobbist breeder of Border Terriers near Halfaix Nova Scotia. Click through our site to discover more about us, the breed and our puppies.